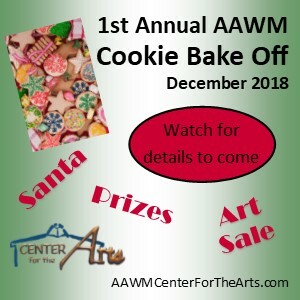 Watch for upcoming details in November on Facebook @ AAWM Center for the Arts, in White Mountain Coffee News, the Maverick Magazine, White Mountain Independent and KVSL Christmas Bazaar, Pictures with Santa & Mrs. Claus, Artistic gifts for sale, and of course COOKIES...and prizes. Cookies, cookies and MORE cookies -- is YOURS the best? It might be! Click here for complete details on the new Cookie Bake-off! EACH MONTH - Check for a new inspiring BLOG post on Barbara's website. SPECIAL EVENTS & APPEARANCES - Be sure and check each month for new events on the calendar page. Plan to join Barbara for her annual Feng Shui Vision Boarding Workshop at AAWM's The Center for the Arts. Each year between Christmas and the New Year Barbara hosts a workshop setting intentions for the New Year. Start saving your favorite pictures, and magazines. This is an all day fun event - one that helps jump start the New Year placing your dreams "smack dab in front of you." If you attended the previous year's class, be sure and bring your board back to share your successes or for help in areas that need a little TLC. SAVE THE DATE: Saturday, December 29, 2018, 10am to 4pm. Hi Barbara. My name is Carol. The reason I am sending you this note is to thank you. Thank you from the bottom of my heart for the most beautiful and heartfelt article you wrote about my Dad. WWII Veteran, Walter Craig. You have a gift! Thank you for all you do in our community!